GarageBand exports exactly one file format — the Audio Interchange File Format (with extensions of aif, aiff, AIF, or AIFF). Fortunately, AIF files are the gold standard of audio files, the highest-of-high-quality uncompressed audio that you can save on a disc. AIF files sound great, but a cost is incurred: The files are huge — too big to send via e-mail or download or to stream from the Internet. AIF files are, by definition, uncompressed. They’re usually five to ten times the size of a song in its compressed form (that is, encoded or ripped). Other audio file formats, such as MP3 and AAC, are compressed and are much smaller, by 50 to 95 percent, than the same song uncompressed. Compression, by its nature, takes away part of the sound. In theory, it’s the part that people can’t hear, but some people do notice a big difference between uncompressed audio and compressed audio, even on cheap stereo systems. Others can’t tell any difference. Some people can hear the difference between compressed audio files that are encoded (ripped) at bit rates of 160 and 192 Kbps. Others hear no difference. The smaller, compressed audio files sound good enough to most people most of the time and have become a de facto standard for consumer audio. iPods (and most other personal music players) and iTunes (and most other personal music-playing software not made by Microsoft) can play both uncompressed and compressed files. But most people store most of their music as compressed audio files, allowing five, eight, or even ten times as many songs to be stored in the same amount of hard drive space. The compressed file formats can encode your song at different bit rates. The higher the bit rate, the better the song will sound. Alas, the higher the bit rate is, the bigger the file will be. The quality of an AIF file is top-of-the-heap because it, by definition, contains 100 percent uncompressed audio. Nothing has been added or removed; every note, breath, harmonic, overtone, string noise, buzz, hiss, and other sound in the master recording is in an AIF file. Technically, the files on an audio CD are “Red Book Audio” files, which are slightly different from AIF files. The technical aspects aren’t important; the important part is that when you shove an audio CD into your Mac, it sees Red Book Audio files and automatically thinks of them as AIF files. No conversion or translation is needed — to your Mac, Red Book Audio files are AIF files, and vice versa, even if the rest of the world says that Red Book and AIF are different. The problem is, while uncompressed audio may be the right format for shiny silver discs, it’s not the right format for e-mail or the Web, because AIF files are gargantuan. Fortunately, if you have GarageBand, you also have the right tool for compressing AIF files, and in fact, that tool is already open and ready to rip. That tool is GarageBand’s iLife sibling, iTunes. With iTunes, it’s child’s play to compress (rip or encode) AIF files into MP3, AAC, or even Apple’s new high-quality lossless encoder, and it’s all done behind the scenes using iTunes built-in (and very high-quality) encoders. MP3 and AAC are the two most common compressed audio file formats on the Mac. MP3 came first and has essentially been the compressed audio standard for many years. Then, a couple of years ago, when Apple introduced the iTunes Music Store, it also introduced the AAC file format, which it uses for the store’s rights-protected songs. Figure 1 is worth a couple of thousand words — it shows the same song saved in all four formats and the size of each file. Table 1 is a handy reference to the different file types and the common ways in which each type is used. Figure 1: Compare the file size of the same song saved in four different file formats. Audio CDs, iTunes, and archiving music in the file format that retains the most audio information. Can be used with iPod, but files are 5–10 times the size of compressed formats. The equivalent of an uncompressed AIF file on a Mac, this format is used for sharing files with Windows users. File sizes are 5–10 times the size of MP3 files, which is the compressed file format of choice among Windows users. iTunes and archiving music in the file format that retains the most audio information. Can be used with iPod but files are 3–7 times the size of compressed formats. iTunes, e-mail, the Web, and sharing with Windows users. 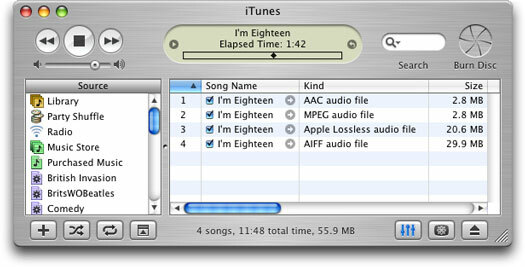 Files are much smaller than either uncompressed format, making MP3s ideal for iPods. Same as MP3 but is Mac-only. Slightly smaller files than MP3 and slightly better sound quality in those slightly smaller files. Most Windows users can’t use AAC files.